Aquatic Base is a stage in Sonic the Hedgehog (2006) for the Xbox 360 and PlayStation 3. As with other levels in the game, it features in all three of Sonic, Shadow, and Silver's stories, although the characters fight their way through the area at different times and for different reasons. Hidden beneath the waters of Kingdom Valley, Aquatic Base was a secret research facility for the city-state of Soleanna. It was here that the Duke and Lord Regis, among others, conducted their time-manipulation experiments on the Flame of Hope during the Solaris Project. After the project failed, both Aquatic Base and Kingdom Valley were abandoned by Soleanna; although at some point in the intervening years, Robotnik has snuck in and retooled the facility as a submarine hiding place for his Egg Carrier. Huge pressure-windows afford a view of swimming dolphins outside, while shield-doors and laser fences restrict movement within the top-secret facility. Several rooms are filled with strange, mercurial orbs; the metallic spheres can be attracted to souped-up electromagnetic pillars, thoroughly pulverising anything that gets in their way. The pillars can also serve to scramble the circuits of any Egg Gunners standing too close during Sonic's playthrough. Mission: Stop the Egg Carrier's Launch! Sonic and Silver's blitz through Kingdom Valley ends in deus ex machina tragedy when Robotnik's Egg Carrier arbitrarily explodes, killing Elise and presumably rendering the Day of Disaster inevitable. As Sonic pounds the ground in frustration, Silver realises that they still have the opportunity to cheat fate. Working together, they open a Chaos Control portal to the past, depositing Sonic back in Castle Town a day earlier, to prevent the launch of the doomed Carrier from Aquatic Base. Recruiting the past versions of Tails and Knuckles, Sonic blasts into the old research facility; no longer abandoned, the area is swarming with Eggman's robots and still-active Soleanna defences to guard the Carrier's hanger. This is the only mission in the game (barring the End of the World) where gameplay switches between three characters. Tails and Knuckles take care of the sections involving bottomless pits, finding switches to allow Sonic to proceed on foot. The S Rank is 50,000 points and completely reliant on enemy score alone. The level is long, and to get a big enough time bonus for an S Rank is pretty much impossible, unless you supposedly back it up with a ton or rings...Anyway, go out of your way to kill a lot of robots, and the S Rank is guaranteed. Of course, you must not die, and with the mercurial sphere walking bit and Tails' bit, that could be a bit of a bother. We recommend the Purple Gem upgrade for the former (if you don't have it, well, that's unfortunate. Maybe you can grind stages for enough rings to purchase it, or just get that lovely camera to give you a proper view and get really good at this puzzle? ), and extreme caution for the latter. Well, caution will get you far in the former too, but you know what we mean. Leave a ring or two around a combat heavy arena just in case of a lucky shot, which is very likely with the camera and Tails' controls. We find Tails' first person mode to be a bit helpful in some situations, so get a little good with it and remember to try carpet bombing with dummy rings. Don't think every robot has to die for the S Rank. The stages carries way more than enough. For example, in the bottomless pits sections? Okay to miss a couple. If you're a worrywart, you should apply the same caution you apply for Tails' bit for the entire level. And stop being a vicious psychopath after you reach 50,000 points. A Rainbow Ring in two bottomless pits sections. Get them. The electromagnetic pillars counts towards simultaneous point bonuses. You can get about 8,400 points with 4 of them in the big circular room. A tip about Hard Mode: It's basically the exact same level with added enemies (making the S Rank even more easy, but giving a hindrance to Tails' section by a small amount), and some confusion as were to go in the beginning of Tails' section (Hint: Really examine all the entrance doors), and that's pretty much it. By the time you get to Knuckles' section, if you're good you'll probably have already reached beyond 50,000 points. So feel fire to skip his combat. Shadow (and Silver's) visit to Aquatic Base takes place back in time, when the facility was still under the supervision of the Duke. After witnessing firsthand the collapse of the Solaris Project and the scission of Solaris into Iblis and Mephiles, the two hedgehogs take off through the facility to stop the newborn demigods before they can cause any further damage. Shadow's route here is similar to Sonic's, with Silver stepping in to levitate his way through Tails and Knuckles' areas. During the final section of security tunnels, Shadow is conveniently provided with a motorbike with which to speedily mow down the Iblis monsters released by the recent disaster. After the level, Shadow uses Chaos Control to seal Mephiles in the Scepter of Darkness, thereby instigating the demigod's previously unexplained thirst for revenge against Shadow. Occuring concurrently with Shadow's story, Silver's playthrough includes the Ultimate Lifeform as a vice-versa secondary character. Having just observed the birth of both his mysterious benefactor and greatest enemy in the same catastrophe, Silver rushes off in an effort to infanticide Iblis. Shadow is controlled only in a brief section at the start of the level; from then on, it's all Silver. 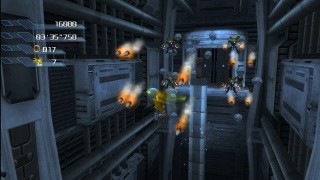 Although similar segments exist for both Sonic and Shadow's stories, Silver has to navigate a particularly lengthy route atop one of the giant mercury spheres, dodging both laser fences and the Iblis monsters inhabiting platforms on the walls. In the post-level cutscene, Silver watches the Duke's dying act of sealing Iblis inside Elise. The hedgehog then goes on to initiate two quite pernicious paradoxes, locking the blue Emerald in an ontological loop and taking the grey Emerald out of history for 10 years, thereby precluding any of the super transformations seen in previous games. Thanks a lot, Silver.